As usual there are too many beans for me to grow them all out this year. Found in the seed box were these Carter's Polish. I don't remember requesting them from HDRA so they must have been a lucky dip selection. 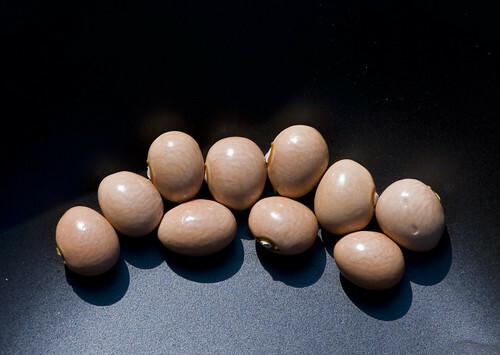 Peabean shaped, they are healthy solid looking beans with a glossy coat. As usual the Heritage Seed Library is vague and imprecise with details on the variety which always annoys me. On their website the bean is described as a tall grower with purple flowers and mottled purple pods. No history, no provenance and no real explanation about why this is a variety worth preserving except that it seems to exist. It could be a modern Polish breed or a Victorian selection named for the polish of its shiny coat. Almost certainly it is grown elsewhere in the world under another name but we'll never know. It has attained nirvana, trapped forever in a fluffy hazy world of seed saving nostalgia and well meaning middle class angst. O.k. I'm beginning to sound a bit bitter now. I'm going to grow it and see. It might make the grade for my core selection of seed saving exercises but if I don't like it I shall give away all the seeds and not bother with it again. That, ultimately, is the only valid criteria for growing anything. The Striped Bunch I did choose, not so much for the apocryphal back story that came with them that they originated in Right Beaver Creek, Knott County, Kentucky but because I wondered if the seed would resemble Tiger Eye beans, since I fancy growing them but can't really justify the difficulty of obtaining seed. They don't much but there is at least a bit more information available about them on the web. 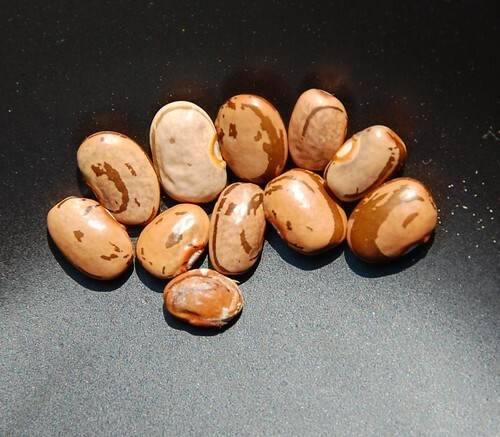 They are described as a half-runner, something that will confuse British readers since runner beans are Phaseolus coccineus and these beans are P. vulgaris, which we call French beans. However, it simply refers to the length of the climbing vine and means that these beans will grow to a height of between 3 to 5 feet. They will apparently produce 12cm long round bean pods which are ideal for pickling. I've never pickled beans before but I'm willing to give it a go. These beans are now planted so more news on them as it breaks. Also planted yesterday, half a dozen Giant Purple, runner bean White Emergo and Riana's climbing green french bean. I must ask her again if she can remember the name of the variety because it was great last year. And next, I'm planting out the courgettes. No rain forecast until Thursday and that's a bit tentative. The bean top center, of the polish ones, is bizarrely perfectly round. It's hypnotising me. :) Goes well with the kitty ident!